"We get it lady - we do not want to buy your product." Hmm...I'm thinkin' I've been sassy to the tv one too many times in front of her. ha-ha! I do hate commercials. Then night before last, I hear her telling this big story to Mike while he's drying her hair. It's all about the Care Bears. She tells it the entire time he's drying. I finally have to go take a picture of them because it's so hilarious. Check out her face in this picture. She was screaming so he could hear her over the hair dryer!! I love his reactions to her. He just listens and then he asks questions like the Care Bears are real. He said, "Are these the Care Bears we know?" She said, "Yes!" I'm impressed he's blow drying her hair. My DH trys, but it comes out in knots when he does it! Poor thing wore a pony-tail everyday the last time I was out of town for work! Sounds like she has a great imagination. Brian is in charge of bath time at our house and tha includes the hair, but we don't have to dry just yet. K's hair dries in about 5 minutes all on it's own! I am so glad that I got to see you this weekend. I will let you know when I am going to be back in town again. I love that picture. It makes me smile! Funny story! 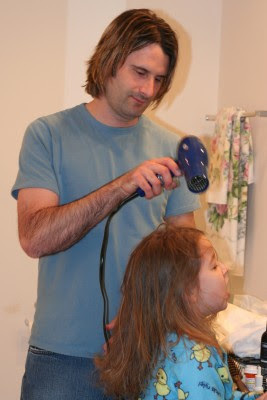 I am totally impressed that he is drying her hair. My sweet hubby says, "but you do bathtime so much better than me." I hate to tell him, but I probably do!